Have you ever had an idea in your head that you just can’t shake? One that constantly nags you until you finally give in and try it out? For me that idea was carrot cake frites, and I’m really glad that I gave in and finally made them! This idea was actually born a few years ago. I was working at a restaurant with a chef who told me “Meghan if you want to get press, you have to start incorporating weird ingredients in your desserts”. Are you serious?! Boy did he have the wrong girl. If someone is going to write about my desserts I want it to be because I made a fabulous dessert, not because I stuck an anchovy in panna cotta. Thank you very much! Now I totally love playing with new ingredients and trying new things, but just to get some press, I think I’ll pass. I also believe that success comes when you do what you love, not when you try to be something you’re not. Okay so about a week later this same chef gets an article written about him. What was the article on you ask? Frites, and I’m being serious. So needless to say I went on a bit of a rampage at this point, my poor assistant. What I basically came up with was that if he could get an article on frites, I was going to turn my carrot cake into frites and serve them with cream cheese aioli. I have to admit I really thought it was genius. Anyway after a few days I got over it, but for the past few months they have been back in my head. So after talking about them incessantly to anyone who would listen, I finally made them. All I can tell you is that they are beyond fabulous!!! They turned out tasting surprisingly light with the funnel cake acting like a light airy pillow around the carrot cake. The sea salt in the cinnamon sugar topping balanced the frites beautifully, and completely sealed the deal. The cream cheese aioli is my cream cheese frosting turned into a dipping sauce by adding sour cream. The sour cream also cuts down on the sweet factor by adding a little tang to it making it the perfect accompaniment. They look awesome, taste delicious, and they’re totally me! I hope you make them! Whisk milk & egg in to dry dries just until incorporated. Cream room temperature butter and cream cheese together. Slice up 1 loaf of frozen carrot cake. Dip each piece of carrot cake into funnel cake batter. 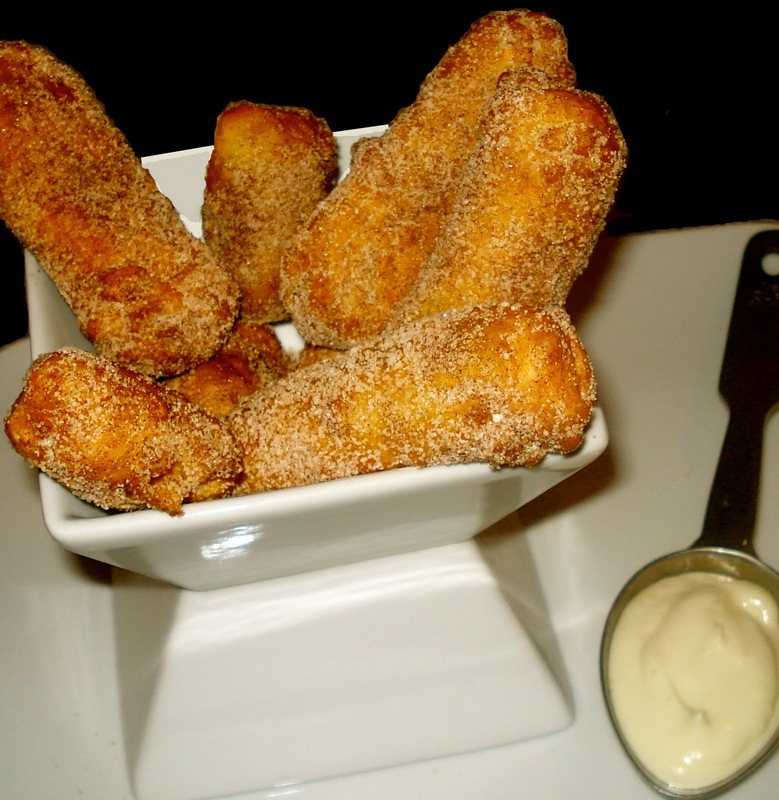 Dredge in cinnamon sugar & serve. 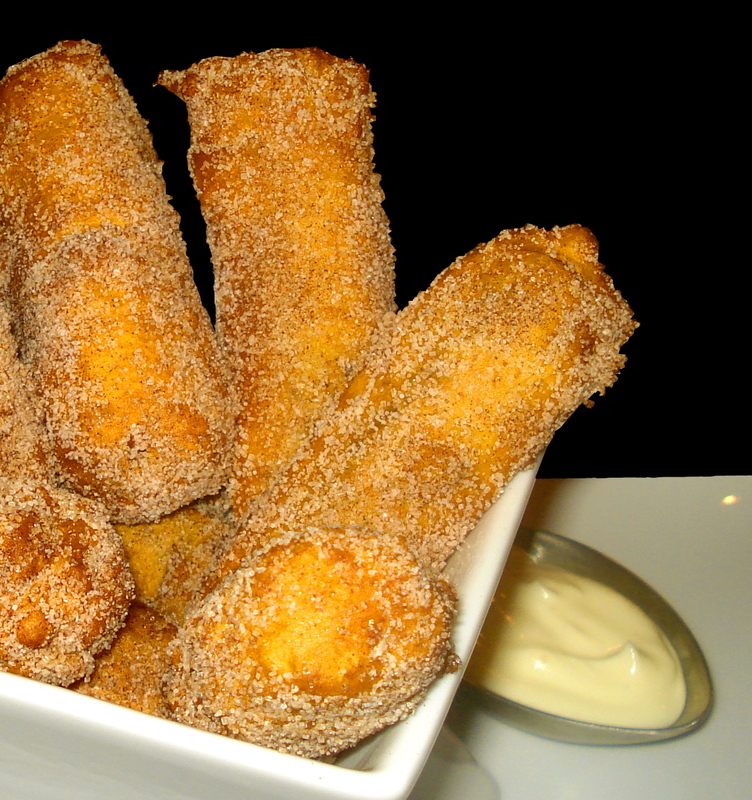 >These look so amazing, esp with the cream cheese dip on the side, delish! >It would have been absolute tragedy for you to not have made this. I sincerely believe it. It's a phenomenal idea. I love all three components; funnel cakes, carrot cake and cream cheese frosting. I'm sold. >This looks unbelievable! Carrot cake is my favorite dessert and this is definitely innovative and looks delicious! >I am pretty sure this is one of the most amazing things ever…I love anything carrot. >Meghan, how creative! This is an incredible dessert! Love the cake 'batter' buzzzzz! >Oh wow these babies look fantastic! >What a creative idea!!! I absolutely love this!! >This was a great idea, indeed. I agree, success should come from doing what you love, not trying to lure people in with crazy ideas. Great post, I pinned this one! >OH, YES!!! These look amazing!!! I'd pick these over pommes frites every.single.time! WOW. >Oh my! Let me pick myself up off of the floor! Ahhhhhh-mazing! >Looks wonderful! Enjoyed the video clip. Thanks for sharing. >What an awesome idea! Sounds sooo delicious. Very creative and cute, love it! >I love your video! Makes everything look so much easier! >Very creative Meghan, can't wait to try them. Very excited to try the dipping sauce also. >Wow, this is decadent but as a carrot cake lover I kind of need to try it. >These look terrific! I completely agree with you – if you're not making something you love and believe in – no amount of press is worth it! Congratulations on an amazing invention! >Great job on the video! Very fun, and what a great way to make dessert and easy finger food. >What a great idea! So glad you finally made them! They look wonderful! >Such a fun idea. Wish I could grab one and start dipping. >Um now I'm not going to be able to get these out of my head-L O V E! >Yum what a great idea! Glad you finally decided to make this one 🙂 I want to make these for date night with my BF, he will be so impressed! >Dang girl, what a fun recipe! I just may have to make these and feature them on my blog, I think they are a perfect fall treat. I am glad you followed through with you fantastic idea. Cant wait to try.